When I started remembering things, I was living in Jacksonville, Florida with my paternal grandmother. Her name was Phoebe; I don't know what her maiden name was. I'm pretty sure she was born a slave. One day in 1912, I was with my grandmother in the backyard when she was washing clothes. She had a big iron pot of water set up over a fire, and she was stirring the clothes with that awfully smelly yellow soap she made out of tallow and lye, when my mother came up. I didn't even know it was my mother. My parents had divorced, and I didn't remember seeing her. She and my grandmother got in a big argument out there in the yard. They started pulling at one another. My mother was taking the train to California with my sister, and she wanted me to come with her. It was almost train time. My grandmother wouldn't give me up, and my mother finally had to leave. But she stayed in touch. She had two sisters and two brothers living there, who came every week to see me. They would buy me clothes. 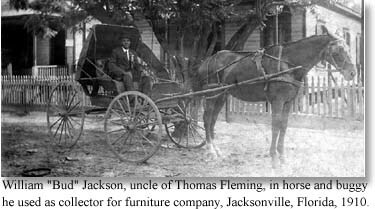 My mother's oldest brother, Uncle Bud, was a collector for a furniture company in Jacksonville. Some blacks couldn't afford to pay a large sum of money, so they would buy furniture and pay about a dollar a week. Uncle Bud had a horse and buggy, and he took me with him when he made his collections. Automobiles were very rare. Jacksonville and Tampa were the major ports of call in Florida for passengers ­ much bigger than Miami. Seaports were more important then, because the only way you could travel was by train or ship. There were no buses going from city to city. Our house was right across from the streetcar barns. I don't know if the blacks chose to live in that part of town, or if they were forced to. Blacks there operated separate grocery stores and meat markets, but there were only about two of each. They didn't have many commercial businesses. Coastwise steamers went from Florida to New England, and they all stopped in New York. 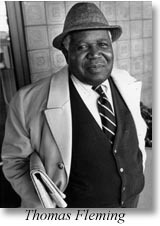 Blacks from all along the South Atlantic coast talked about New York, because for most of them, that was their destination. Others went to Philadelphia or Boston. They were aware that in the North, they could vote, get away from segregated schools and find jobs paying more than they could earn in the South. You'd have to have seen it, to realize how rigid the segregation was, and how humiliating. When you got on the streetcar, you walked to the back to sit down. They had a sign posted behind a row of seats, and as more and more white people got on, they moved that sign further back, so soon there wasn't any place for blacks to sit at all. And you'd better not talk back to any white person. Every black in the South knew that. I was told what I couldn't do, and I observed it. I wondered why I couldn't do it. They didn't try to explain it to me, but I was always very curious about it. I started school in Jacksonville ­ it was all black ­ and I learned to read very well before I got out of second grade. My father had no sense of responsibility for a family life at all. I don't know why he got married. Not long after my mother left, my grandmother got real sick. My father moved in with her, and he got one of his girlfriends to shack up with him there and take care of my grandmother. She was sick for a long time, and right after she died, my father wanted wanted to get rid of this woman, because he met a younger woman in town. He took a table leg and beat that woman and threw her out of the house. I was watching while it was going on. Soon after that, my father moved to New York City. He sent for me, and I lived with him in Harlem from 1916 to 1919. Then I made one last trip to Florida before coming out to California. I have always held a strong resentment toward any state where Jim Crow was a way of life. I never set foot in Florida again until 1968, when I covered the Republican National Convention in Miami.